"The more you sweat in peace, the less you bleed in war." America lost a great military commander today--General Norman Swartzkopf died at the age of 78 in Tampa, Florida. 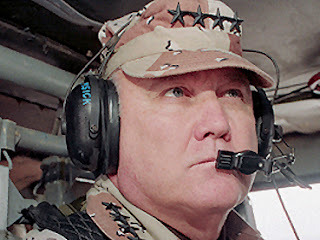 Best known for his no-nonsense approach during the Desert Storm campaign that so swiftly removed Saddam Hussain from Kuwait, it earned him the nickname Stormin' Norman. Our Illustrious Blogmeister Todd has requested we send pictures of Masonic signs. I guess this is my way of doing that. I live in Kearney, Missouri (Not to be confused with Kearney, Nebraska, which it often is). We're located about 20 miles northeast of Kansas City and in spite of the fact that civilization keeps oozing our way, we're still somewhat rural. One hundred thirty years ago, Kearney was a thriving farming and commerce center. The Hannibal and St. Joseph Railroad (now the Burlington Northern Santa Fe) stopped here, giving businesses critical access to both Chicago and Kansas City. In that year, 1882, Kearney saw two significant events. First, foremost and, like-it-or-not, the one that puts us on the map, our favorite but oh-so-notorious son, Jesse James met his untimely and violent end and was buried here. There have been, over the years, those who have claimed Jesse isn't buried here and didn't even die then. In 1994, we got fed up with all that, dug him up, ran tests, proved it was him and put him back in a shiny new coffin. So there. I attended that auspicious event where vendors were doing a brisk business selling T-shirts that said, "In Kearney, We Dig Jesse." To get back to the point, the other big event in Kearney in 1882 was the completion of the Masonic Lodge. I doubt Jesse ever saw the building. He was way up in St. Joseph at the time and was otherwise occupied until they brought him back on ice (really). That 1882 building still stands at what was the town's main intersection. I'm certain it was, at the time, the most magnificent building Kearney had ever seen. I don't have exact dates but probably about 25-30 years ago Kearney Lodge surrendered its charter and then re-chartered in the mid-2000s. I affiliated immediately and since then, Kearney Lodge #311 has continued to grow. We still don't have a permanent building, but every time I go into town, I spend a few minutes looking at that old building with its weathering concrete Masonic sign (it's not a cornerstone) and wish it was ours. Maybe someday it will be. No matter what happens, I hope we can at least get back that terrific old sign, a reminder of days gone by. Liberty Lodge No. 31 (MO) sign--well worth the 5K donation! Since there was no Kearney Lodge when I became a Mason, I joined Liberty Lodge #31, about six or seven miles south. The town of Liberty is a whole different story. The streets are paved with gold and cash flows from the fire hydrants. Not quite, but almost. It's a bustling, growing, thriving area. And Liberty Lodge (in spite of what our budget committee might claim) has thrived right along with it. When I joined, we owned our own building smack-dab on the town square, had paying tenants and life was good. Then Sunday, May 4, 2003, waltzed in and spoiled the party. That day, an F2 tornado rolled through. Our Lodge building took a direct hit. It actually cracked the building in half, ripped our two-ton air conditioning unit from its rooftop foundation and not-so-gently dumped it on the street below. Engineers at first told us the building was lost, an assessment that fortunately turned out not to be true. It took months of work and lots of money, but we restored the building to a condition better than before the tornado hit. What insurance didn't cover, we did. Jesse James went down the year Kearney Lodge went up! We had moved into that building in the early 1950s. Our sign was a somewhat elaborate affair which hung perpendicular to the building. 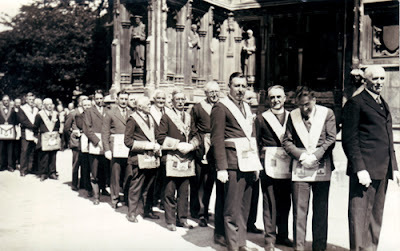 On both sides, it had the emblems of the Masonic bodies there and whenever any of those bodies met, that portion of the sign was lighted. Needless to say, the sign did not survive. We found enough pieces of it that we were able to give it to an artist to recreate the glass sheets on either side, but there was a problem. In the intervening years, Liberty had passed an ordinance that, for whatever reason, signs on the square had to be parallel to the building. At first, the city told us we could not replace the sign in its perpendicular configuration. We prefer to think it was our excellent negotiation skills and not the $5,000 we donated to the disaster fund that reversed the town's decision. At any rate, if you drive around the Liberty square today, you'll recognize our landmark sign. It's the only one on the square perpendicular to a building. And we're still smack-dab on the town square, have paying tenants and life is good. Steve Harrison, 32° KCCH is a Past Master of Liberty Lodge #31, Liberty, Missouri. He is the editor of the Missouri Freemason magazine, author of the book Freemasonry Crosses the Mississippi, a Fellow of the Missouri Lodge of Research and also its Senior Warden. He is a dual member of Kearney Lodge #311, St. Joseph Missouri Valley of the Scottish Rite, Liberty York Rite, Moila Shrine and is a member of the DeMolay Legion of Honor. 'I see you're a Mason!' the Tiler relayed. The Master replied, 'Let's allow him - but wait! Our visitor hasn't been properly raised? Of "Lodge Number One, the North Pole" on one line! By my Warden, a craftsman like none in the world!" On all that is good! 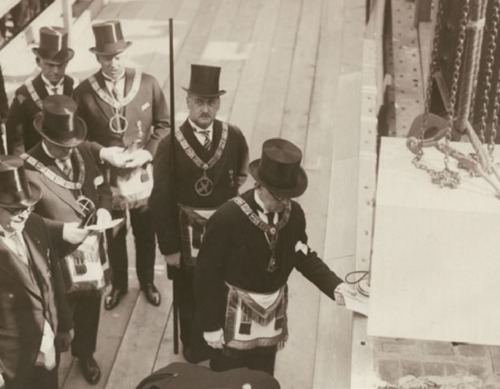 We are Masons, kind sir!" I don't know where this came from originally. It was forwarded to me. I really enjoyed it, and thought you might enjoy it also. 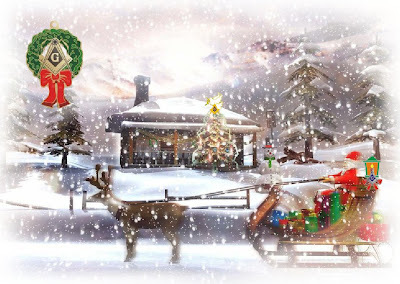 December, the time of each year where the masses get ready to embrace a new year and rebirth. Holidays are plenty, Hanukkah, Christmas, The Solstice, Kwanza and during these time there are seasonal plants which bare special meanings. Two such plants ring aloud like a beautiful song, and when you put those notes on paper, you eyes would behold an evergreen and the mistletoe commonly brought into homes this time of year. The meaning of the Christmas tree goes back to Scandinavia, when the people would bring the still green tree into their homes as everything else died in the winter months. This was done as a good luck symbol, as a symbol of life that conquers death. We in Freemasonry call it the Acacia. 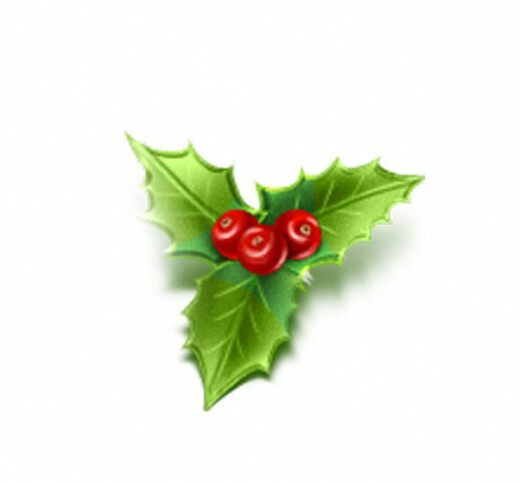 But as you have no doubt read, this article is entitled Mistletoe. The mistletoe has also an astounding significance to Freemasonry. The mistletoe was a sacred plant among the druids and symbolized immortality, again a direct correlation to our acacia. In Scandinavia they called it simply “mistle”. 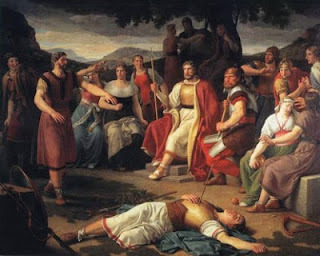 In Scandinavian mythology, the second son of Odin was named Balder. Balder had a dream that he would die, upon waking he held council with the Gods. His mother Frigga then cast a spell which gave him immunity from all harmful things, poisons, darts, water, earth, fire, birds, plants reptiles and beasts. After some time the Gods began to test Balder's immunity by sending danger his way. This displeased Loki, God of mischief. So he disguised himself as an old woman and secured from Balder’s mother the one thing omitted from the spell that protected her son. The shrub mistletoe. Loki fashioned a dart of mistletoe and gave it to the blind God of war who was still having fun testing his non-vulnerabilities, helped him take aim, and pierced Balder’s heart killing him. Sorrow among the Gods was immeasurable. The tears of Balder's mother Frigga, are said to have formed the white berries on the mistletoe plant. And from then on Balder is said to to wait in Hades until the end of the world. The power of mistletoe to symbolically “pierce ones heart” by commanding a kiss from any who walk under it is what we perceive today. However mistletoe has one last interesting point that I wish to convey before the end of this short piece. It is a shrub that many cultures have deemed sacred because the leaves and berries always grow in three and come from one common stalk. Like Freemasonry, we two have three which delineate from one stalk or in our case the men who were first prepared to be a Masons in that place in which the mistletoe can pierce, the heart. 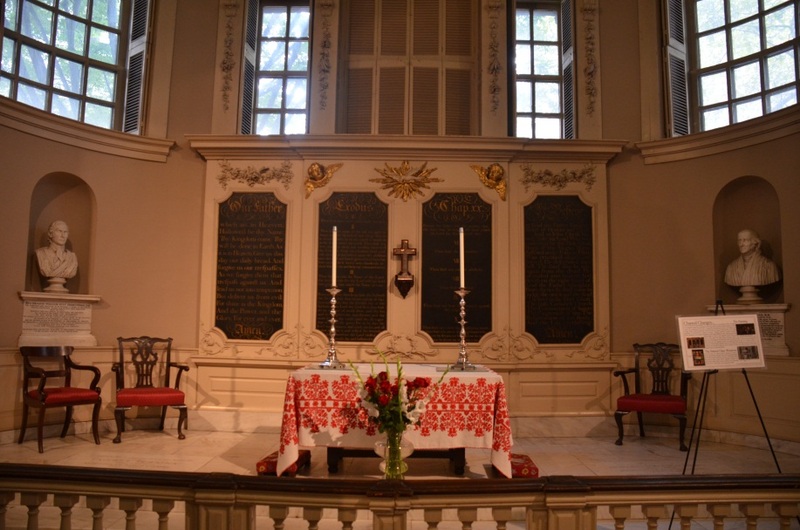 King’s Chapel was founded in 1686 as an Anglican congregation with loyalty to the King of England and over the years it grew and needed a new building. In 1754 the current building was completed and was made of Quincy granite. 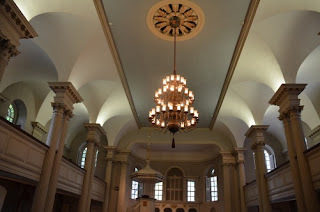 Over the years it went dark, converted to a Unitarian Congregation and finally to the current independent congregation affiliated with the Unitarian Universalist Association. The governance system consists of elected officers, Senior and Junior Wardens, Treasurer and Assistant Treasurer (sound familiar?). 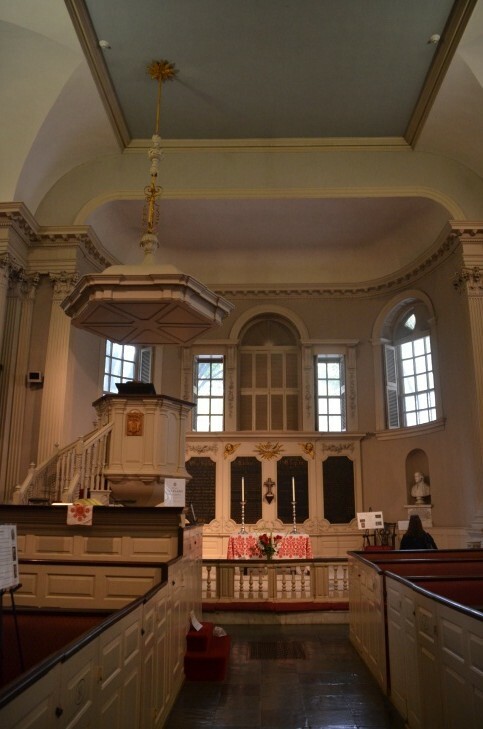 The bell in the Church tower was forged in England was hung in 1772 and developed a crack in 1814 and was recast by Brother Paul Revere and rehung in 1816. You can hear the bells on You Tube. 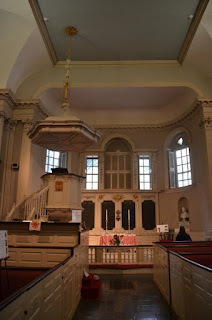 As one would expect in a chapel of this historic nature, many famous persons have worshiped here including: Dr. Oliver Wendell Holmes, Paul Revere, Benjamin Franklin and General Joseph Warren who was killed in the Battle of Bunker Hill. By visiting King’s Chapel, one sees the importance that religion played in the founding of America. This history of this church illustrates the sacrifice that so many of its members made over the last 300+ years in helping shape the American culture. 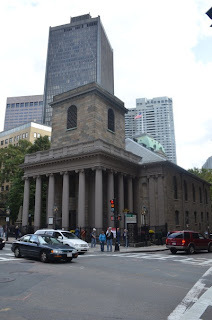 Next up on the Freedom Trail the Old South Meeting House. One of the things I learned early in my Masonic journey is that Illinois rod work is militarily precise when done by those who are good at it. I'm not good yet, and since I'm studying for the Certified Lodge Instructor exam, I need all the practice I can get, so I was delighted to find an old Steward's rod at an antique mall in Minocqua, Wisconsin, while on vacation. 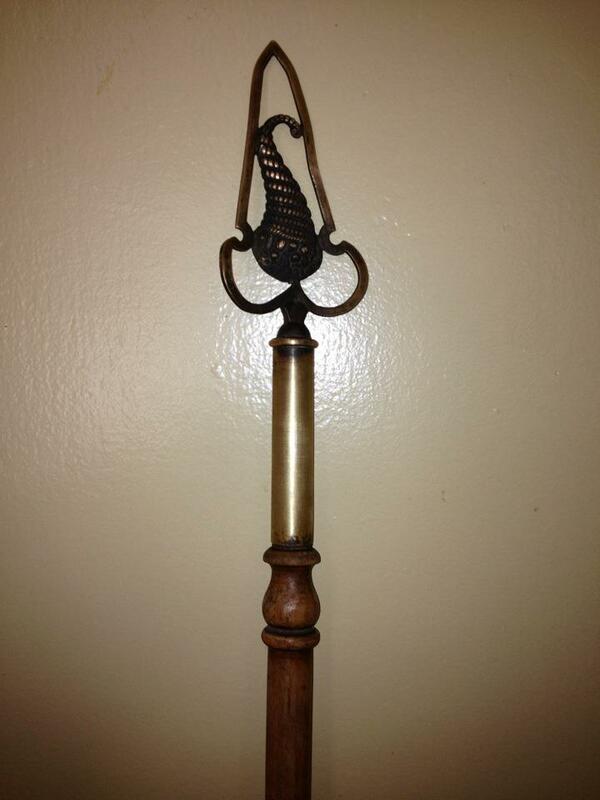 It was hanging on a wall with a tag that read "Parade Pole. Great Curtain Rod! $22." It was dirty, and the metal rod top was so tarnished it looked like wrought iron, but it was exactly what I needed and I grabbed it. When I took it up to the counter to pay for it, I mentioned to the gentleman who took my money that the description was inaccurate. "It doesn't matter," he said. I said nothing, but it bothered me, because it does matter. Saying that a thing's true name doesn't matter is to dishonor the reason it exists. My Steward's rod would probably make a good curtain rod, and it is a parade pole of sorts, but it was made for a specific purpose, a Masonic purpose, and its true name tells that story. So now it leans in a corner in my house. The brass top polished up nicely, and lemon oil brought some depth to the wood. The base is worn where it was repeatedly taken out of its holder and replaced at stated meetings and degrees, and it's slightly curved from age, but it looks much better than when I first saw it. My rod work is improving, and somehow using a real rod for its real purpose makes me work a little better than I did with the length of PVC I used before. There's weight to it, a solidity that is its own history. Its Masonic journey, interrupted for who knows how long, continues. With its help, so does mine.